The Anglican-Roman Catholic International Commission published its first document in 13 years on how both institutions can learn from each other in the exercise of ecclesial authority locally, regionally and globally. The document, “Walking Together on the Way: Learning to Be the Church – Local, Regional, Universal,” is the first to come out of the third phase of the Anglican-Roman Catholic International Commission, known as ARCIC III, which began meeting in 2011. The Pontifical Council for Promoting Christian Unity made the document public on its website July 2. The latest agreed statement on how structures of authority support and promote ecclesial communion is considered a key element in understanding how discussion and debates are handled and decisions about ethics and “right” moral teachings are made, which will be the topic of the next document by ARCIC III. The document explores the respective structures of the Catholic Church and the Anglican Communion and identifies the challenges and difficulties each tradition faces at the local, regional and worldwide levels. It then asks what each tradition holds that might be transformative or beneficial and learned from the other tradition so as to better support the mission of the church. “This task requires frank assessment, repentance, and the courage to look at ourselves honestly and learn from the other,” the agreed statement said. 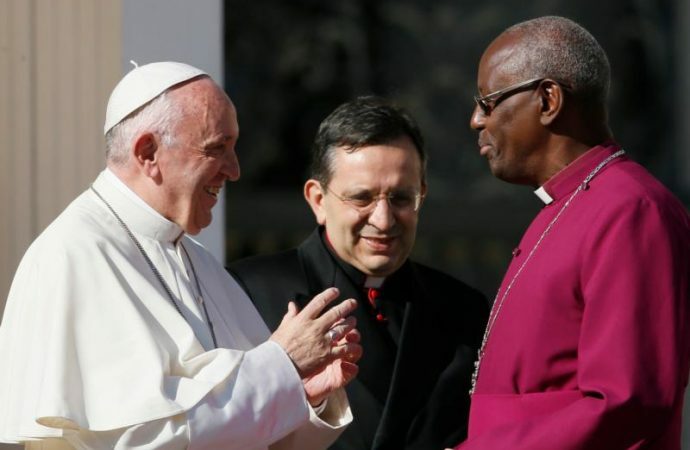 While the Vatican and the Anglican Communion office authorized publication of the new document for study and discussion, the Roman Catholic Church and the Anglican Communion do not consider it an official statement until the Vatican and the Anglicans’ Lambeth Conference officially approve it.